Herpes zoster is caused by the chickenpox virus (varicella zoster). The varicella zoster virus is a type of herpes simplex virus (HSV) but is not the same as the herpes simplex virus that causes genital herpes. Herpes zoster is not a virus but a syndrome that arises with reactivation of the varicella zoster virus (VZV) years or even decades after chickenpox. Herpes zoster is the same as shingles, an alternative and commonly used name for this condition. The main symptoms of herpes zoster is a painful rash. Herpes zoster is more likely to occur in a person with a depressed immune system and the elderly. Vaccines are an effective preventative measure but the infection can still occur. Herpes zoster, commonly known as just zoster or shingles, is a condition caused by the reactivation of the varicella zoster virus (VZV). This is also known as the herpes simplex virus type 3 (HSV-III). Herpes zoster is not a separate virus on its own. The varicella zoster virus causes the common childhood infection known as chickenpox which resolves after a few weeks. However, the virus remains dormant for long periods of time in the body and may sometimes reactivate to cause inflammation of the nerve roots. This does not happen in every person who had chickenpox and is more frequently seen in diminished immune states. Shingles is the syndrome where a painful skin rash marked by the presence of tiny blisters usually forms on a dermarcated area on the skin surface of the head or trunk. It is caused by the reactivation of the varicella zoster virus (chickenpox virus). Shingles can affect any age group but is more commonly seen in the elderly and those with depressed immune defenses. The virus targets certain nerves with symptoms such as the rash and pain being isolated to those areas of the skin supplied by a single spinal nerve. Although shingles resolves within a month, it can sometimes lead to complications or the pain can persist for months thereafter (post-herpetic neuralgia). Vaccines provide an effective albeit not guaranteed protection against developing shingles. Chickenpox is a common childhood infection caused by the varicella zoster virus. After the active phase of the infection resolves, the virus stays dormant at the spinal nerve root, specifically the dorsal root ganglion. This dormant state is known as the inactive phase or latent phase. The virus can remain dormant for a lifetime in this way. Once the virus reactivates, it causes inflammation of the nerves and is therefore also known as acute posterior ganglionitis. It mainly affects the sensory nerves but can sometimes involve the motor nerves – those nerves that control muscles in the body. Although the peripheral nerves to the trunk is commonly affected, the virus may cause inflammation of any part of the nervous system, even the brain (encephalitis), meninges (meningitis) or both (meningoencephalitis). However, shingles often arises for no known reason even in a person without any of these contributing factors. Age seems to be a major risk factor and shingles is more frequently seen in the elderly. Herpes zoster mainly affects sensory nerves but motor nerves that control muscles may also be affected. This gives rise to symptoms such as paralysis of the diaphragm, bladder and bowel problems, cranial nerve palsies and muscle weakness. The rash is typically isolated to a dermatome on one side (unilateral). A dermatome is an area of the skin which is innervated by nerves from a single spinal root. Therefore the rash appears along the course of the affected spinal nerve root. The rash appears as skin redness with tiny blisters. It is an itchy and painful rash. The blisters form scabs about a week after it appears. The shingles rash usually affects only one side of the head or trunk at a time. The pain is also isolated to dermatome and follows the same distribution as the rash. Pain along with itchy and tingling may be felt a few days before the rash develops. It is typically described as a burning pain. The pain also resolves within a month in most cases. Pain that lasts for longer than a month, even after the rash clears, is most likely a complication of shingles known as post-herpetic neuralgia. 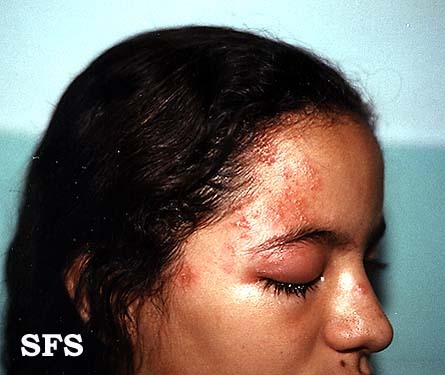 All images have been sourced from the Dermatology Atlas (2) courtesy of Samuel Freire da Silva, M.D. 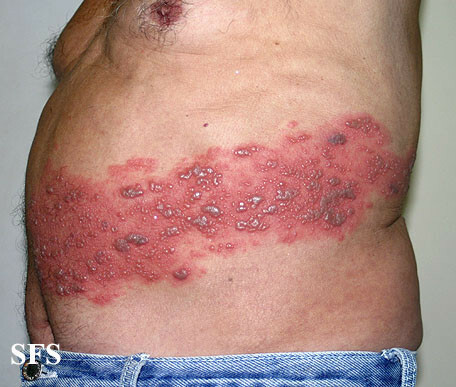 Picture of herpes zoster (shingles) rash on the body (trunk). 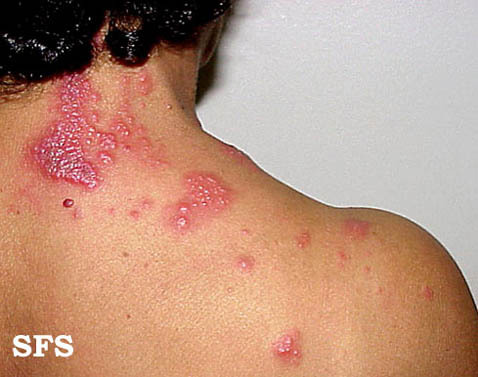 Picture of herpes zoster (shingles) blisters. Picture of herpes zoster (shingles) rash on the face. 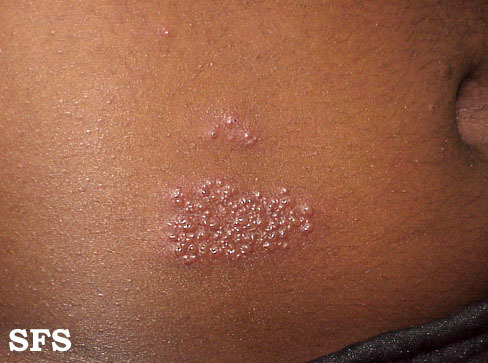 Picture of herpes zoster (shingles) rash on the back. Antivirals – acyclovir, valacyclovir and famciclovir. Anesthetics (cream, gel or patch) – lidocaine. Tricyclic antidepressants, anticonvulsants and corticosteroids along with anesthetics may be needed for post-herpetic neuralgia. Treatment should be commenced immediately once a diagnosis of shingles is made, preferably within the first few days of the onset of the rash. The most effective way to prevent herpes zoster (shingles) is to be vaccinated. Chickenpox vaccine to prevent the initial varicella zoster infection (chickenpox). Zoster vaccine to prevent shingles and should be considered only for a person older than 60 years of age. Vaccines are not always a guarantee of avoiding the infection. However, if the infection occurs in a vaccinated person it is usually less severe and shorter in duration.